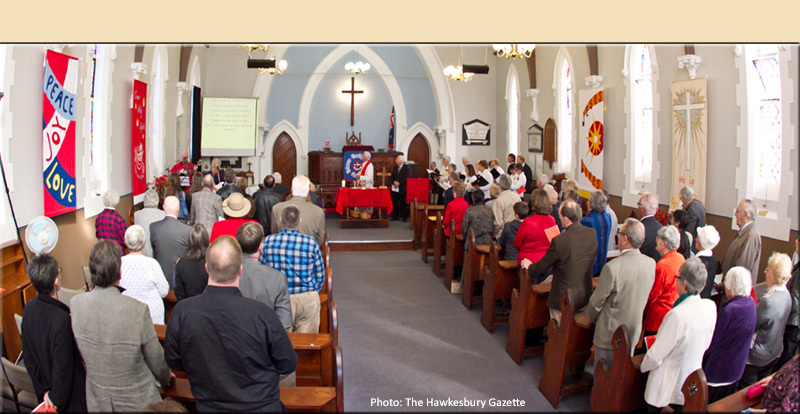 a congregation which was first established in 1812 as the Wesleyan Church in the newly established communities of the Hawkesbury. Here you can find information about the Christian community which meets in our historic heritage listed buildings. Our first chapel was opened in 1820, the second larger chapel in 1838, with the third church on the site being opened and dedicated in 1876, following the devastating Windsor township fire just before Christmas 1874, which destroyed both the church and the minister's residence next door. Windsor Uniting Church, a congregation of the Uniting Church in Australia (a union of Presbyterians, Methodists and Congregationalists which took place in 1977) is a warm and welcoming community of faith, proclaiming and enacting the Good News of Jesus in both our worshipping life and in the community at large. We invite you come and join us. We'd love to welcome you! Our Worship Services - Sundays 9.30am - "You're Invited!" We worship together on Sundays at 9:30am, followed by a get-together time with refreshments. Traditional as well as contemporary in worship style, we are trying to be a community worshipping place for all. Holy Communion is celebrated on the first Sunday of each month, as well as other significant days in the Christian Calendar, such as Christmas, Easter and Pentecost. Also on other special occasions. Children are an important part of our Church. There are also extra activities designed for children on Sunday mornings during school terms. We welcome all of you to come to celebrate our faith in Jesus Christ. The two sacraments of the Christian Church are Baptism and Holy Communion. Holy Communion is celebrated on the 1st Sunday of month and at other times of significance in the Church Calendar, such as Christmas, Easter, Pentecost and anniversaries. The Table is open to all who are in communion with the church universal. The Minister at Windsor is part of the wider Ministry Team within the Hawkesbury Regional Zone. Currently this Team Leader position is vacant, but we are actively seeking a new Minister. In the interim, Rev. Sharon Cutts is the Supply Minister. Rev. Rodel Palma is the other Team member. The two Ministers serve the congregations of Windsor, Riverstone, Ebenezer, Pitt Town and Kurrajong Heights. The Richmond Congregation, whose Minister is Rev. Je-Kon Oh, is also a part of the regional arrangements. Ministry activities are also under the guidance and authority of the local Church Council, of which in Windsor there are eight members. It's a weekly afternoon gathering from 3pm to 5pm with a variety of activities to engage people from all walks of life in learning and developing community. A time for Craft, a Chat, some Coffee and Cake, and wonderful Company! Please join us. For more information, please phone 4577 3147. "You're Invited!" Our Bible Study Group, specially for women, meets twice monthly, 2nd and 4th Saturdays from 8.30am to 10am at the Windsor Uniting Church. Leader: Mrs Fiona Kidd. More Information? Phone: 4572 7281.